WARNING: Sotalol should be used only in certain patients. Before taking sotalol, discuss the risks and benefits of treatment with your doctor. Although sotalol is effective for treating certain types of fast/irregular heartbeats, it can infrequently cause a new serious abnormal heart rhythm (QT prolongation in the EKG). This problem can lead to a new type of abnormal (possibly fatal) heartbeat (torsade de pointes). If this new serious heart rhythm occurs, it is usually when sotalol treatment is first started or when the dose is increased. Therefore, to reduce the risk of this side effect, you should begin sotalol treatment in a hospital so your doctor can monitor your heart rhythm for several days and treat the problems if they occur. Patients usually start with a low dose of sotalol. Your doctor will then slowly increase your dose depending on how you respond to the medication and how well your kidneys work. If you respond well to this medication, during this time in the hospital your doctor can determine the right dose of sotalol for you. Some sotalol products are used to treat certain types of fast/irregular heartbeats (atrial fibrillation/flutter). These products come with additional written information from the manufacturer for patients with atrial fibrillation/flutter. If you have these conditions, read the provided information carefully. Do not switch brands of sotalol without checking with your doctor. Do not stop taking this medication without consulting your doctor. Some conditions may become worse when you suddenly stop this drug. Some people who have suddenly stopped taking similar drugs have had chest pain, heart attack, and irregular heartbeat. If your doctor decides you should no longer use this drug, he or she may direct you to gradually decrease your dose over 1 to 2 weeks. When gradually stopping this medication, it is recommended that you temporarily limit physical activity to decrease strain on the heart. Seek immediate medical attention if you develop: chest pain/tightness/pressure, chest pain spreading to the jaw/neck/arm, unusual sweating, trouble breathing, fast/irregular heartbeat. USES: This medication is used to treat a serious (possibly life-threatening) type of fast heartbeat called sustained ventricular tachycardia. It is also used to treat certain fast/irregular heartbeats (atrial fibrillation/flutter) in patients with severe symptoms such as weakness and shortness of breath. Sotalol helps to lessen these symptoms. It slows the heart rate and helps the heart to beat more normally and regularly. This medication is both a beta blocker and an anti-arrhythmic. HOW TO USE: See also Warning section. Read the Patient Information Leaflet (provided by your pharmacist for some sotalol products used to treat atrial fibrillation/flutter) before you start using sotalol and each time you get a refill. If you have any questions, consult your doctor or pharmacist. Take this medication by mouth, usually twice a day or as directed by your doctor. You may take it with or without food, but it is important to choose one way and take it the same way with each dose. Dosage is based on your medical condition and response to treatment. In children, dosage is also based on age, height, and weight. Use this medication regularly to get the most benefit from it. To help you remember, take it at the same times each day. If you use antacids containing aluminum or magnesium, do not take them at the same time as sotalol. These antacids can bind to sotalol and decrease its absorption and effectiveness. Separate doses of these antacids and sotalol by at least 2 hours to reduce this interaction. Do not take more of this drug than prescribed because you may increase your risk of side effects, including a new serious abnormal heartbeat. Do not take less of this medication or skip doses unless directed by your doctor. Your fast/irregular heartbeat is more likely to return if you do not take sotalol properly. Also, do not run out of this medication. Order your refills several days early to avoid running out of pills. Tell your doctor if your condition does not improve or if it worsens. SIDE EFFECTS: See also Warning section. Tiredness, slow heartbeat, and dizziness may occur. Less common side effects include headache, diarrhea, and decreased sexual ability. If any of these effects persist or worsen, tell your doctor or pharmacist promptly. To lower your risk of dizziness and lightheadedness, get up slowly when rising from a sitting or lying position. Remember that your doctor has prescribed this medication because he or she has judged that the benefit to you is greater than the risk of side effects. Many people using this medication do not have serious side effects. Tell your doctor immediately if any of these unlikely but serious side effects occur: new or worsening symptoms of heart failure (such as swelling ankles/feet, severe tiredness, shortness of breath, unexplained/sudden weight gain). Seek immediate medical attention if any of these unlikely but serious side effects occur: severe dizziness, fainting, sudden change in heartbeat (unusually faster/slower/more irregular), chest/jaw/left arm pain. A very serious allergic reaction to this drug is rare. However, seek immediate medical attention if you notice any symptoms of a serious allergic reaction, including: rash, itching/swelling (especially of the face/tongue/throat), severe dizziness, trouble breathing. This is not a complete list of possible side effects. If you notice other effects not listed above, contact your doctor or pharmacist. In the US - Call your doctor for medical advice about side effects. You may report side effects to FDA at 1-800-FDA-1088. In Canada - Call your doctor for medical advice about side effects. You may report side effects to Health Canada at 1-866-234-2345. PRECAUTIONS: See also Warning section. Before taking sotalol, tell your doctor or pharmacist if you are allergic to it; or if you have any other allergies. This product may contain inactive ingredients, which can cause allergic reactions or other problems. Talk to your pharmacist for more details. This medication should not be used if you have certain medical conditions. Before using this medicine, consult your doctor or pharmacist if you have: certain heart rhythm problems (such as a slow heartbeat, second- or third-degree atrioventricular block unless you have a heart pacemaker), severe heart failure, breathing problems (such as asthma, chronic bronchitis, emphysema). Before using this medication, tell your doctor or pharmacist your medical history, especially of: kidney problems, treated stable heart failure, very recent heart attack (within 2 weeks), other irregular heartbeat problems (such as sick sinus syndrome), overactive thyroid disease (hyperthyroidism), serious allergic reactions needing treatment with epinephrine. 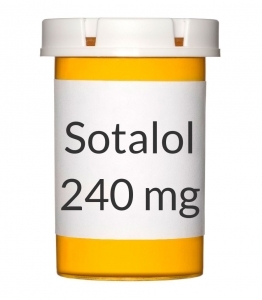 Sotalol may cause a condition that affects the heart rhythm (QT prolongation in the EKG). QT prolongation can infrequently result in serious (rarely fatal) fast/irregular heartbeat and other symptoms (such as severe dizziness, fainting) that require immediate medical attention. The risk of QT prolongation may be increased if you have certain medical conditions or are taking other drugs that may affect the heart rhythm (see also Drug Interactions section). Before using sotalol, tell your doctor or pharmacist if you have any of the following conditions: certain heart problems (QT prolongation in the EKG, history of torsade de pointes), family history of certain heart problems (QT prolongation in the EKG, sudden cardiac death). Low levels of potassium or magnesium in the blood may also increase your risk of QT prolongation. This risk may increase if you use certain drugs (such as diuretics/"water pills"), if you are unable to eat or drink fluids as you normally would, or if you have conditions such as severe/prolonged sweating, diarrhea, or vomiting. Talk to your doctor about using sotalol safely. If you have diabetes, this product may prevent the fast/pounding heartbeat you would usually feel when your blood sugar level falls too low (hypoglycemia). Other symptoms of a low blood sugar level, such as dizziness and sweating, are unaffected by this drug. This product may also make it harder to control your blood sugar levels. Check your blood sugar levels regularly as directed by your doctor. Tell your doctor immediately if you have symptoms of high blood sugar such as increased thirst/urination. Your diabetes medication or diet may need to be adjusted. Before having surgery, tell your doctor or dentist that you are taking this medication. This drug may make you dizzy. Do not drive, use machinery, or do any activity that requires alertness until you are sure you can perform such activities safely. Limit alcoholic beverages. Kidney function declines as you grow older. This medication is removed by the kidneys. Therefore, older adults may be more sensitive to the side effects of this drug, including dizziness and tiredness. During pregnancy, this medication should be used only when clearly needed. It may harm an unborn baby. Discuss the risks and benefits with your doctor. This medication passes into breast milk and may have undesirable effects on a nursing infant. Discuss the risks and benefits with your doctor before breast-feeding. DRUG INTERACTIONS: See also How to Use and Precautions sections. Drug interactions may change how your medications work or increase your risk for serious side effects. This document does not contain all possible drug interactions. Keep a list of all the products you use (including prescription/nonprescription drugs and herbal products) and share it with your doctor and pharmacist. Do not start, stop, or change the dosage of any medicines without your doctor's approval. A product that may interact with this drug is: fingolimod. Many drugs besides sotalol may affect the heart rhythm (QT prolongation in the EKG), including amiodarone, dofetilide, pimozide, procainamide, quinidine, macrolide antibiotics (such as clarithromycin, erythromycin), among others. Check the labels on all your medicines (such as cough-and-cold products, allergy products, diet aids) because they may contain ingredients that could increase your heart rate. Check with your doctor or pharmacist first before taking any other medications. This medication may interfere with certain medical/laboratory tests, possibly causing false test results. Make sure laboratory personnel and all your doctors know you use this drug. OVERDOSE: If overdose is suspected, contact your local poison control center or emergency room immediately. US residents can call the US National Poison Hotline at 1-800-222-1222. Canada residents can call a provincial poison control center. Symptoms of overdose may include: severe dizziness, fainting, unusually slower/faster/more irregular heartbeat, shortness of breath. NOTES: Do not share this medication with others. Laboratory and/or medical tests (such as EKG, kidney function tests) should be performed periodically to monitor your progress or check for side effects. Consult your doctor for more details. STORAGE: Store at room temperature at 77 degrees F (25 degrees C) away from light and moisture. Brief storage between 59-86 degrees F (15-30 degrees C) is permitted. Do not store in the bathroom. Keep all medicines away from children and pets. Do not flush medications down the toilet or pour them into a drain unless instructed to do so. Properly discard this product when it is expired or no longer needed. Consult your pharmacist or local waste disposal company for more details about how to safely discard your product. MEDICAL ALERT: Your condition can cause complications in a medical emergency. For information about enrolling in MedicAlert, call 1-800-854-1166 (USA) or 1-800-668-1507 (Canada). Information last revised June 2012. Copyright(c) 2012 First Databank, Inc.